When powering the green car of the future, one man is turning to Fred Flintstone for inspiration. Charles Greenwood is the creator of the HumanCar, an automobile that’s powered by you and me and maybe some of your friends. The Imangine "Urban" concept design by Stephen Brand for the HumanCar. Rowing handles produce the electricity the car needs to move it forward. Greenwood says it’s made entirely of recycled plastics and can reach speeds of up to 60 miles per hour as you row away, but he says there’s also a back-up electric motor in case you get tired of rowing. “It's just exactly like an engine firing around the four cylinder cycle. In this case, we can see we got one, two, three, four, firing around” Greenwood says as he points to four people rowing the HumanCar. The HumanCar costs $15,500 and you can pre-order one for a $99 deposit. They are set to roll out next year on Earth Day. What do you think? Is a human-powered vehicle a good fuel alternative? Wouldn't it be easier and cheaper to just ride a bike? easier to ride a bike? IS there a bike that goes 60mph like the humancar? This is an idiotic invention. For $15K+ this is completely nuts! Also do you know how much effort is required just to generate 100 watts of electrical power (especially assuming a maximum of 70% conversion efficiency)? Just producing 100 watts for 10 minutes would completely exhaust most people, much less 1Kw for even 2 minutes. I think a lot of the ideas that have been put forth lately based on using human electrical power generation are totally unrealistic given the above limitations. Also, if you want to make a human powered device, it's better just to stick to purely mechanical devices .... i.e. like a regular bicycle. People just don't appreciate how much 'work' is required to generate something like 1Mw (something like 100,000 people each generating 10 watts). It's actually quite amazing that we can generate the amount of power that everyone takes for granted. this thing is extremely overpriced. I would design an electric bike instead. You pedal for awhile, then you coast for awhile, driven by your charged up battery powered electric motor. (c)2008 Me, thank you. Why would you pay upwards of 40 K for a gas-guzzling car when you could travel for MILES AND MILES for nothing after the cost of the car? This is extremely cheap for a car! In fact, I had never dreamed of purchasing a new car in my lifetime until I found out about this! As for the claim that this is an idiotic invention, well, whoever said that is obviously not hurting from gas price inflation and/or doesn't realize what causes 20% of current anthropogenic carbon dioxide emissions (I'll give you a hint: it burns fossil fuels as you travel in it). Also, the 15 K covers lots of perks. 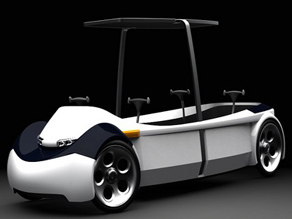 On the HumanCar website, it points out features like optional air-conditioning and iPod compatibility. So if you thought, just because it was compared to a Fred Flintstone car, that this was a primitive vehicle, you now stand corrected. Also, only die-hard bicyclists ride their bikes during snowy winters. I think everyone who knows what harsh winters are like would agree that a car-like vehicle would be more preferable. Being from the Northwestern United States, I have been aching for a clean form of transportation during my seven months of winter. Which has lower carbon tireprint ? Threaded running shoes, unicycle, bicycle, tricycle ? Sounds just like an "Irish Mail" that I had a s a kid. You pumped away on the crossbar – that was linked to the rear axle like a crankshaft. The crossbar, or wheel in some cases, did the steering, too. But I agree with Anon that four people never would be able to get it up to 60 mph, much less store enough energy to do anything but light up a flashlight or two. I can't stop laughing, I just can't stop laughing . . .
Just imagine 4 politicians on this thing...each flailing away, all out of sync...achieving a new record of 0 mpg! Of course, we could always bag the hot air for ballooning! Actually the Kettcar (Irish Mail) recollection is an apt one...when I was 5 or so, I had a two-wheeled scooter that worked by pump action, and later on I rode many bikes. I never tried a "Rolli" (a French motorized bike), but the more recent ones with the motor built into the hub of the wheel look practical for the summer. The big, 4-handled Kettcar of the story would be impossible to work in the winter's slush and snow, not to mention the exposure to the outside air. I have to give the people who invented the machine some props on creativity. Those people that are knocking it. I have a question for you. What have you done to try and better the earth while improving human health? I think this would be great for family time excerise. I do agree that it is high priced. The cost of manufactoring something like this is what makes it that way. No-one wants to work for free. Hard pavement and hard tires reduce tire friction. Has to be based on bicycle concepts for efficiency. Air drag is proportional to cube of speed. Very good aerodynamics to get speeding ticket ? Japan got US foothold in 1970’s oil crisis, and kept gaining market share. This time, Chinese, around town vehicles, at your Wall E market ? Which three friends would you loose first, the overweight ones? I think it is a bit overpriced. Does it come with windows? It would not be practical on cold weather conditions. If they made one that was a two seater and was able to store more power, with pedals instead of the bars would be better for this application. Drag racer, motorhome, or limousine, just modifications of the basic design. The car on the site looks beautiful. What may be the most significant element is the point of entry for the concept of mobile power generation ( at ANY wattage level). When to lights go out is when this makes the most logic. As far as the price I see the car has more in common with an exotic supercar than a bicycle. It's based on a 200mph chassis the company says (which is also completely independent and self-funded). Imagine if we saw more of this technology . . . we'd be that much closer to rapid solutions. Bravo HumanCar! Way to have the stones to get out in the face all that is and all there is to come. To answer Silby, yes a bicycle can go over 60 mph, but only if you want to ride on a special track with very special assistance from a powered vehicle in front of you. In practice, not a chance. The 200mph frame is just silly, unless it means that the engineering is based on that of race cars. But, a racing car chassis must deal with high stresses due to the speed and power involved. The most applicable engineering is for bicycle frames, which have been developed to have minimum weight and handle the stresses of slow speed human powered travel. It seems to require 4 people to power, but when was the last time you saw even a few cars in rush hour with 4 people in them? Also, the statement that 100 cars could produce 100KW requires that each car produces 1KW, or about 1/3 horsepower per person (assuming perfect efficiency!). Most people simply can't do this for even a short time. Worse, it must be done with your arm and back muscles, not your legs (there isn't enough room behind the last 'oar' to slide back as a racing shell does. A bicycle does use your legs, and will be much more efficient. Can we set up a race with 4 people of equal fitness for each team; 4 in the car and 4 on bicycles. To be more realistic lets throw in 100 lbs of groceries. And, $15,000 buys a lot of bicycles to boot! Finally, how do you steer if your rowing? PS: does it have a built in 'on-star' like system to call the para-medics when you have a heart attack? Great idea...but I'm not going to buy it. I don't care how much gas costs or how green other people are, I'm still going to drive. Didn't they already invent this? It's just a 4 passenger motorized wheelchair. Plus, when any other car T-bones you in an intersection....you are dead meat. Awesome Car But most americans Hate excercise so they Probably won't want to Row A car to get around!!!!! But i like the idea because it is very eco-Friendly!!!! Makes you realize how stupids cars are in general. We waste so much of our wealth and national security so we can go buy breadsticks whenever we want. I saw an italian movie couple weeks ago, and they had a motorbike in it I had all but forgotten about. You pedal to start the simple motor, or you can ride as a bike. I wouldn't mind having one. Anyone remember what they are called, and if they even make them anymore, and where to get one? Great idea. Awesome technology. It will undoubtedlly save the planet. But it will also never work. Believe me, I wish a wave of eco-consciousness would overtake America and we would all hum along in our human-powered vehicles singing Kumbaya. However, our indomitable American love of freedom will never allow 4 people to work together, in unison, to get anwyhere. Plus, you would have to tranquilize me to get me into the REAR-FACING backseat of this thing and row while SOMEONE ELSE steered. I'd rather walk and see where I am going. If you want to save the earth, bicycle. Please gives us a break on human power performance. James Watt, the Scottish inventor of the practical steam engine started the industrial revolution. He rated his tsteam engine as so many horsepower because people could relate to the power of one horse. In honor of his invention, electrical power is measure in watts, kilowatts, meagawatts, etc. The crux of the matter is that one horsepower is about 750 watts(first law of thermodynamics). An average well conditioned person can generated(sustained) continuously about 100 watts on a treadmill, elliptical, etc in a Gym for about one hour. This is about one seventh of a horsepower. An extremely well conditioned athlete, like Lance Armstong, can generate about 200-300 watts, in a Tour De France Race for about 8 hours. This is less than one half of a horsepower. In addition the human body is very inefficient in converting chemical energy (food), into mechanical energy(movement). The mechanical efficiency is less than 10%. The statement that 100 humans could generate 100 killowatts of power (one kilowatt per person i.e.one and one-third horsepower) is outrageous. Gas prices coming down, Give me a drag racer, with lots of horses. That's a pretty expensive bicycle! As lazy as we Americans are..... I don't think so. DUMB, DUMB, and DUMBER, although pretty smart for the guy that wants $15,500.00. It's not a bicycle! It's a kayak on wheels. Well, I HOPE it has optional air conditioning. I'm sure you'd work up quite a sweat getting the thing to wherever you are going, lol. These claims sound pretty inflated. 60mph? Tour De France riders can't come near that. How could 4 average Joes put out that kind of power? I'm all for human power ... I commuted 2200 miles this summer. But for $15000, I can buy a real nice bike. Flexibility will make this a winning product. What do you think cars are made for ? Run out of gas at a convenient location ? Too boring, heard it before, unlimited imagination. What about children rowing in the back? Are they driving? Hope no one would try to take this out on the interstate. They would be creamed. i think this is a great idea and that it does not burn as much gas, which would save you money. The fact that it uses plastics that were recycled is great to the ecosystem and would help the green house affect, only becasue it doesnt give off so much gasses. 1) Bad weather? The HumanCar can be made in a coupe style and a ragtop style. They have three different models, one of which is a two-seater. 2) The HumanCar is easy to power. It takes as much energy as riding a bkie, you do not have to pump at the same rate, and if you need additional energy, you can supplement it with the battery power. 3) It is street legal, but not on highways. This is because it is a very low-mass vehicle and it would be dangerous. Think of it as a way to commute daily without burning fossil fuels. 4) To point out the obvious, the car is made in the United States. I don't know about the rest of you, but in these tough economic times, I think we need to put money into our own economy, and our own workforce. We have to realize, though, that you and your fellow Americans like to work for a living wage. So, often times, US-made products can be more expensive. But domestic products don't burn as much fossil fuels via shipping from other coutries (i.e. how much fuel does it take to get thousands of Korean cars here?). 5) Since you don't EVER have to put a DROP of gasoline in it, the savings in gas alone will pay for the car in a matter of years (which varies depending on how much you drive, of course). 6) YES, it does go 60 mph. YES it's $15 K. It is a car, not a bike. I just wanted to point these things out, because I get the impression that many of those who have commented here seem to think that this company would forget to think about modern amenities. Do you not agree that climate change is a serious problem that needs to be dealt with? 70% of Americans do believe so. But what are you willing to do about it? Make a small sacrefice in your life, or wait for some other knight in shining armor? I think human power is the most overlooked savior in the world. One more thing: the HumanCar website also states in the FAQ's that the car can be powered with 1-4 people. Remember, there's a battery in there. I remember the kiddie cars that were powered just the same way. You get very far, I hope this one does better, but it was fun. I don't think the Manpowerd car is a good idea. I Think this is great. A HumanCar, They are on to something. You know what, It's a small sacrefice and great solutions to push us on our way totally Green. Some of us send $5000.00 bike, $ 1000.00 on at cake. I'll get one just hell of it. Why don't we develop exercise facilities that convert all that energy expended by people working out into electrical energy. We are just wasting that energy by not using it. I think we are headed into the right direction here with this car. other ideas and optional features could be added in to this thing. 1.in a windy day unfurl a sail and get an extra push. 2.drive around the neighborhood. the kids will gather around for a closer took at this contraption. then recruit them as partners and use them for extra energy. kids have lots of energy and they come in light weight. to circumvent , child labor law call it an entertainment . 3.in the summer attach a water tank with an exhaust pipe facing rear . and human component of the global warming , water in a tank will boil for sure in a few years ). the exhausting water vapor will give a jet engine effect. 4.one can also use house hold pats like mice, guinea pigs, rabbits , cats and disobedient dogs etc as alternate source of energy. to avoid the wrath of the PETA and law for cruelty to animals , just say you are taking them out in ride. 5.occasionally , when riding along a lonely highway one can use a telescopic , hid able, extend able, and retractable magnetic (electromagnet , of course , using same electrical energy generated by the contraption) coupling hook up to the rear of an unsuspecting truck and have a free ride. if a clever truck driver almost catch you , you can always retract and hide the hook up and give a surprise look and ask " what coupling hook ?" Great idea, be it painful. We won't do it until we're forced to by the government, when there is no more oil available. Then things will have to change real fast. I'm just wondering, if you are rowing, rowing, rowing, how do you steer? Aren't there MoPeds (or something of that ilk) that does this already? You pedal it and it goes on generated energy for a bit... Anyway, I am wondering how someone will ROW and DRIVE at the same time. Those are two different motions. People are already smoking, eating, primping, and chatting on the cell phone while driving causing a hazardous situation. Would it come with air conditioning, because who wants to show up at work dripping in sweat? I guess that would require even MORE energy...better carpool...or at least move very close to your office...of course then you could just WALK or RIDE a bike, both cost FAR LESS than 15 grand. Is it solar powered too on top? Very representative field of US based q and a. Lindsay: Bravo! Everything is cool now that you can get gas for $2.99/gal but it's when the lights go out that the panic at the disco starts. HumanCar Inc. has been off grid for over 20 years and has a 200 year business plan to promote "open standards" (like open-source code) to promote design and advancement. We at HumanCar ride our bikes EVERYDAY and when we show up for rides we find out who the real bikers are. The HumanCar makes you fit and fight ready, as when the chips are down and people are yelling about the sky falling we are sitting tight making more burritos and jamming full watts with the electricity we made. It's that simple. Get ready for change. It's coming faster than expected. The mind is like a parachute. Thank you and stay tuned. Its' on. Hi there! This post couldn’t be written much better! Reading through this post reminds me of my previous roommate! He always kept talking about this. I most certainly will send this post to him. Pretty sure he'll have a good read. Thanks for sharing! Hello there, just become alert to your blog through Google, and found that it's truly informative. I am gonna watch out for brussels. I will be grateful should you continue this in future. Lots of folks will likely be benefited from your writing. Cheers! First of all I want to say awesome blog! I had a quick question in which I'd like to ask if you don't mind. I was curious to find out how you center yourself and clear your mind prior to writing. I have had trouble clearing my thoughts in getting my ideas out there. I truly do take pleasure in writing however it just seems like the first 10 to 15 minutes are usually lost just trying to figure out how to begin. Any ideas or tips? Many thanks!